1 Hi! Would you like to meet my pet? She's a tarantula. Tarantulas are large hairy spiders that live in warm parts of the world. 2 Don't be afraid. 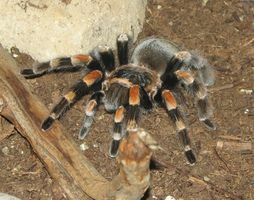 Many people keep tarantulas as pets. In fact, many kids in South America do. They tie a string to one of the tarantula's legs. Then they take their pet for a walk! 3 I don't do that, though. I don't think Terry would like a string tied to her leg. Oh, that's my pet's name- Terry the tarantula. 4 Terry isn't as big as a South American tarantula. They are the world's largest spiders. Some of them are twelve inches across! They are so big that they eat birds. Some of them even attack chickens and snakes!